ROAD TOWN, Tortola, VI- Due to the snap election called by the National Democratic Party (NDP) government, she has a small window of time to familiarise herself with all the issues facing the Fourth District, however, Virgin Islands Party (VIP) candidate JoAnn ‘Roxy’ Romney says she is exhausting all methods at her disposal at doing so and noted that the general feedback so far from the electorate is that they feel neglected and disenfranchised and many are struggling to make ends meet. “The primary response is they feel very neglected, but the number one thing for them is the lack of job opportunities. They want to feel a sense of empowerment, they living hand to mouth and worse yet they only desire to meet their living expenses,” stated Romney in an interview with Virgin Islands News Online today, May 29, 2015. Romney’s critics have said she is not familiar with the issues of the district and that the people do not know her. 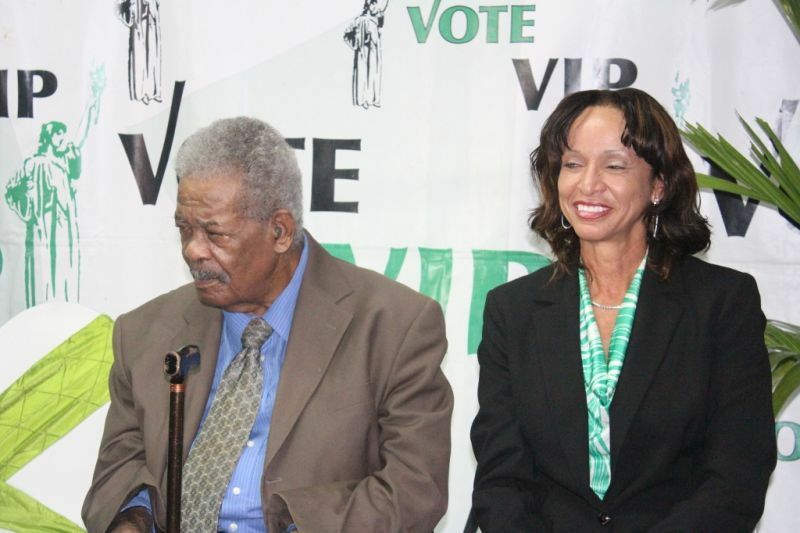 The VIP candidate admitted that it has been a learning experience for her as a candidate seeking office as she has been constantly enquiring about the issues of the district so she could adequately and responsibly represent her constituents if elected. However, she said she has heard enough to know that the people of the Fourth District are not satisfied with their current situation, which is disturbing. “The young people feel very disenfranchised. They feel as though they have no voice at all, and this is the harsh reality,” Ms Romney explained. Meanwhile, Romney appeared on Open Mic with host Julio S. Henry on CBN Channel 51 on May 28, 2015 where Mr Henry had asked the Fourth District candidate and prominent businesswoman to respond to those who claim that they don’t know her and that she knows nothing about the 4th District. 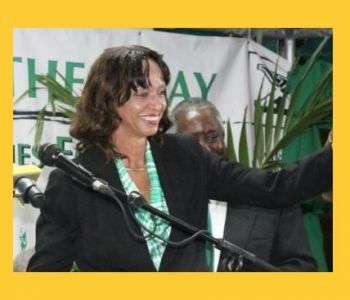 Romney had said her last name speaks for itself as she is the 2nd daughter of the late former Chief Minister Honourable Cyril B. Romney and Lily Romney, and is “BVIslander” from the Creques of Anegada, to the Thomas family from East End, from the Smiths of Salt Island to the Romneys of West End. She further said she grew up in McNamara, went to school right in Road Town and only left this territory on an athletic scholarship that paved the way for her to get her education. She spoke of empowering the people by improving the revenue earning opportunities for locals as one of the ways of achieving a better life for all. Romney reasoned that the government under the Virgin Islands Party has in the past upheld policies of inclusion in business opportunities for its people and on that foundation locals have thrived and became entrepreneurs. Asked by Mr Henry which major issues within the District she would address first if elected, Ms Romney outlined three areas that she believes need urgent attention. “My first order of business would be to complete with no delay, the installation of efficient sewerage disposal and treatment plants as well as [the issues of] continued reliable water and power supply. Romney laid out many more ideas she has for the district on the Open Mic show but also noted that it is more important what the people want and that is why she has concentrated her efforts on trying to hear more from the people rather than the people hearing more from her. “We are a just few days from countdown to June 8th and, unfortunately, we do not have the luxury of time to get to know each other as well as I would have liked. I want to assure those of you who do not know me personally, that I speak openly of my candidacy in this race to represent your interests first,” Romney stated. If she cannot beat Mark now how do you know it would happen next time around "for sure". We are not buying that. We still going Green. Well, wonders never cease. She actually acknowledged that she is family to the Smiths from Salt Island and the Romneys in West End... Oh she just found out....smh! She knows and they know. What is your point? As a Smith with Salt Island roots, I look forward to meeting you. Never. The beating she would get now she wouldn't come back. Although I am not exactly a fan of Roxie's personally, I have to put personal feelings aside and assess objectively what she brings to the table. I sincerely feel that she will provide better representation this time around for the 4th district. Roxie is a shrewd and very experienced business woman, and she probably has more to lose than Mark reputation wise in not performing well and being a lady of her word. She seems more organized and focused on the priority needs, not only of the centre of town, but of the surrounding residential areas as well. When one considers the standards at which Roxie executes her personal and business projects, government is more likely to get better value for money, more projects within budget and a more aesthetically-pleasing result. There is much that could be done in revitalizing the 4th district, and Roxie clearly has the stronger vision as to how to bring about that transformation. All in all, Roxie seems to be the candidate who will do a better job in looking out for the interests of the 4th district. Further, the fact that Roxie is a female candidate is a plus, in that our young ladies need strong role models in taking career paths that are in this 21st century still regarded as gifted to males. I find the argument that Roxie does not know the issues of her district a bit insincere and fallacious. With all politicians who are challenging there will always be a reacquainting of tactical issues which has been buried by the incumbent party in power. This is why there is the "Snap Election." The real question is why the present party (NDP) has ignored those issues which now are being defined? And the news that people do not know her I find even more odd considering her father was a Chief Minister quite beyond the pale. Roxie has got it right with her game plan - Empower the youth by including them in all respects with economic growth. This is what the honorable Ralph T. O'Neal's endorsement of Roxie was meant for. Agree with you except for the fact that all groups need to have a voice. This sound-bite about empowering the youths, all parties are chanting this mantra. Is it not more desirable to ensure that youths get a sound moral and academic training before letting them loose. How many of our youths are critical thinker? How many understand the difference between being materially well off and being a moral, upright, and just person? The fact is that too many of us are singing this song without seeing the necessity of guiding the youths, of seeing that they have a solid foundation. Truth Player, I couldn't agree more with your analysis. However, the operative word in my post was "including," though. This being - "Empower the youth by including them..." and not dismiss or set apart from those issues which define critical thinking, sound moral and academic training which starts at home and at school. Inclusion has to start at a young age which is the foundation to a prosperous and fair society. This is what I am speaking of. I have listened to this lady and I personally that this lady has a bigger and real vision for Road Town. I also listened to Mark's speech on Tuesday night and he didn't say much of his plans for the 4th District and the speech was focused in things on a national level and not specifically to the 4th District. We need more women in our Assembly and it will be a shame that the electorate in the 4th do not elect this woman to public office. I wish I can vote in the 4th. see you in 2019--you will stand a much better chance then--I think you are a good lady--Mark needs to finish what he started, then he will be judged. You don't mingle with the common man, sorry not my vote. You obviously do not know enough about Roxie. She is more common than Mark trust that. Mark is between a rock and a hard place. KMark cannot survive without him being the Minister for works and the Port. Despite the heavy injection of funds from the NDP's wealthy friends, he is faced with a mammoth task of defending his questionable relationship with his staff and the way his Ministry treats the public purse. A break from this type of behaviour would be most welcomed. The truth of the matter is that Mark Vanterpool has done nothing, absolutely nothing for District 4. Mr Mark say Action Speaks louder than words. You are correct. The fact that you have only done and brag about the work ?your ministry has done speaks volume. Road Town is still dirty.What about the chicken s... all over the place. Main Street is ungovernable,. Where are side walks for locals and tourists to walk without worrying about being hit. And, how come you have done nothing about thieves climbing people's mango and coconut trees, which they go and sell. Ms Romney is much much better for D4. She has the humility to admit that she needs to learn more. And, she has provided some concrete plans for the district. She has a vision. What plans has Vanterpool put forth? If so then, Mark should've left Road Town smelling like SHTTTTT !!!!! You UNGRATEFUL people !!!!!! Mark will kill this lady, Mark is on fire right now love him r hate him.